When it comes to breaking into vehicles and stealing whatever is inside, luck plays a huge role. For instance, someone might break into a car and find thousands of dollars, a brand new laptop and several firearms. That would be a pretty sweet score. On the other hand if you break into enough cars you’re eventually going to pick the wrong one. And in Florida the other day that’s exactly what happened. Known as the “why did I do that?” face. 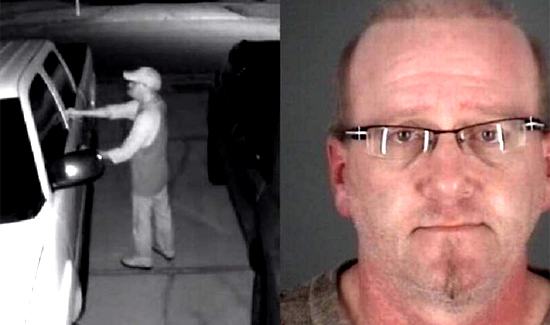 Surveillance video shows Stephen Titland, 49, in Pinellas County, Florida breaking into a series of vehicles. The last one he tried to rob just happened to be filed with members of the Pasco Sheriff’s Office’s Strategic Targeted Area Response Team. The best part about this thing is it’s one of those cases where the expression on the guy in the mug shot’s face tells you everything you need to know.